Do yourself a favor. 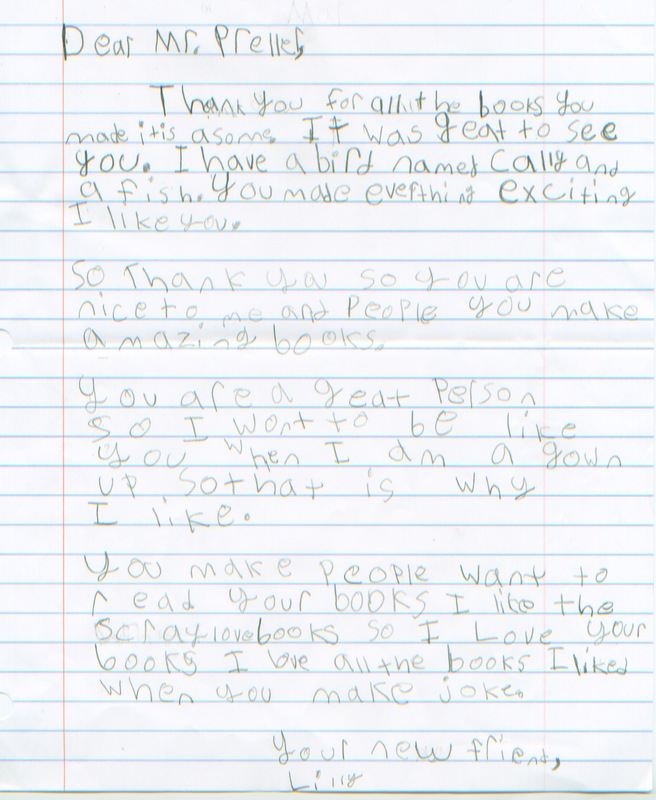 Take a moment to read one of my favorite letters, just exceptionally sweet & kind. You know, it’s not about me. It’s about Lilly, and kids like her. There are so many of them out there. Pure and good and excited about books, open and bursting with light. It could be any author or illustrator who walks into a school. Who gets that opportunity to stand before these children, talk about reading and writing and our silly pets. On this day, it happened to be me, and I reached a receptive reader named Lilly. Again: How lucky am I? I enjoyed my visit to your school, and was especially glad to receive a wonderful batch of letters from your class, taught by Ms. B.
I read each and every letter. But I have to confess that yours, in particular, stirred my heart. You were so kind, said such nice things, that I wanted to take a minute to thank you. Writing is a quiet life. At this very moment, I am alone in silent room of my house, pecking away at a computer keyboard. Sometimes I will speak the words out loud so I may hear them, to know they are okay. My cats don’t talk much. I play music, daydream, try to write. It can be lonely at times. I sometimes fill with self-doubt. Even when I finish books and send them out into the world, I never really know what happens to them. That’s why school visits are nice; I get to meet kids like you. And sometimes, on very good days, some of those readers write letters. And that’s when I know I’ve made a new friend. Please say hello to Cally, your bird -– and, of course, your terrific fish.